This Christmas, What did My True Love Gave to Me? Leave a Comment on This Christmas, What did My True Love Gave to Me? I am not a fan of holiday themed novels, but I decided to give this one a shot because it contained short stories from two of my favorite authors, Rainbow Rowell and Jenny Han. 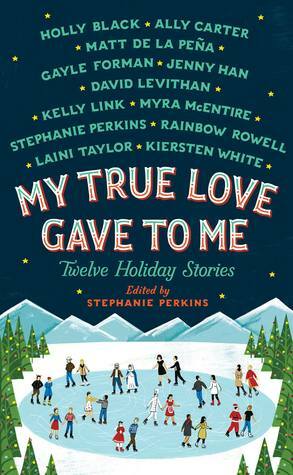 Surprisingly, My True Love Gave to Me: Twelve Holiday Stories, edited by Stephanie Perkins, became a Christmas classic for me. All of the short stories had something in common: the main protagonist had some sort of imperfection—a dysfunctional family or physical and mental insecurities—that prevented him or her to enjoy the holidays. The main character’s depressing attitude changed when someone brought forth Christmas in his or her life; in which provided a sense of hope that “everything will be okay.” When I finished reading all the stories, I was reminded that one of the reasons why we celebrate Christmas is hope. Despite all the chaos in the world today, our daily struggles and personal problems, we keep pushing forward in hope of a better tomorrow. Christmas is a day to celebrate the hope, stirring in our hearts, that a better life is possible. I wanted to keep this post short, but I couldn’t. There is a lot to say about each story, so I’m going to comment on all of them. The concept of time is used throughout Rainbow Rowell’s “Midnights” and Kelly Link’s “The Lady and the Fox.” In “Midnights,” Mags and Noel always missed their opportunity for a midnight kiss on New Years. It is through this example that Rainbow Rowell discusses the idea of “perfect timing” and “not-so-perfect timing” in romance. Another way Rowell plays with time is telling the story in a series of flashbacks leading up to the present-day. While in “The Lady and the Fox,” every first snow fall around Christmas time, Miranda encounters a mysterious man with an embroidered fox on his coat, Fenny Honeywell. Miranda slowly develops feelings for Fenny. Now, I won’t give away what happens, but the ending was surreal and strange. In addition, there is so much going on in the story—Miranda’s mother is in a Thailand prison, the descriptions of the luxurious, rich Honeywell family, Elspeth Honeywell’s relationships with men, etc.—that at the end, I was left with many unanswered questions and half-baked thoughts. It isn’t a bad thing to be left with confused feelings, but I would like to open the floor for other people’s thoughts and conclusions on this tale. So if you have something to say about this story, please let me know. The stories, “It’s a Yuletide Miracle, Charlie Brown,” by Stephanie Perkins, “Welcome to Christmas, CA” by Kiersten White have a similar storyline: a girl from a broken family, is not looking forward to Christmas, but then a mysterious, charming man spreads holiday cheer to the girl, creating a Christmas miracle in her eyes. One may interpret this as another form of a “damsel in distress” story. Yet, I enjoy these plot lines because the stories show romance in a cute and cheesy way. Also, the stories seem to clearly address the title of the anthology, What My True Love Gave To Me. Yet there are two stories, “Beer Buckets and Baby Jesus” by Myra McEntire and “Star of Bethlehem” by Ally Carter, with a storyline that is opposite from the previous paragraph. Rather than having someone else bringing a Christmas miracle, the main protagonist creates a miracle for others around them. “Beer Buckets and Baby Jesus” (I have no clue why there is a mention of “beer buckets” because I don’t recall any beer bucket in the text unless I overlooked it when reading) is a story of change; in which individuals with ill-manners and behavioral issues transform into kind, hardworking people. Ally Carter’s “Star of Bethlehem” reminded me of the Disney Channel TV Show, Hannah Montana. I’m not going provide more information about this story because I’ll ruin the surprise at the end, but if you plan to read it, just think Hannah Montana. Besides being a holiday themed story, some of the short stories discuss controversial issues that it caught my attention immediately. These topics are strongly emphasized and relevant in today’s society. In “Angels in the Snow,” Matt de la Pena comments on social classes. The male protagonist, Shy, is unable to fly home for the holidays because he can’t afford a plane ticket from New York City to San Diego, CA. Furthermore, Shy is stuck cat-sitting for money and is starving to death—eating only a cup of frozen yogurt as a meal—because Matt didn’t stock any food in the apartment. Shy’s current situation shows his poor social background. However, it is through sharing living necessities such as a working shower stall and food, that Shy and the female lead, Hayley learn to understand each other despite having different social backgrounds. First of all, I would like to thank all the authors who decided to use people of color as their main protagonists because it brought in different perspectives on the holidays. Secondly, race consciousness is mostly prevalent in “What The Hell Have You Done, Sophie Roth?” by Gayle Forman. Racism is a sensitive topic, especially with what’s going on in the news lately. Yet this story left a strong impression within me because it holds strong optimistic ideals of how individuals should interact with each other. In the story, a Jewish girl, Sophie Roth, befriends a male African American student, Russell, and they spend their evening celebrating the last day of Hanukkah. Forman situates her characters in a racial conscious atmosphere; in which both characters are reluctant to talk about certain topics involving ethnic backgrounds and race because they were afraid it might be offensive. However, Russell and Sophie broke down racial barriers, and were able to freely communicate and understand each other. We don’t seem to notice how race creates walls and boundaries that prevents people from freely interacting and understanding each other. Yet this story brought forth racial consciousness into light, and suggests that in order to get to really know a person, you should understand his or her character. The story, “A Temporary Santa” by David Levithan comments on sexual orientation. A boy dresses up as Santa Claus for his boyfriend’s little sister, Riley, so that she can still continue to believe in Santa.The boy feels guilty for pretending to be a real Santa in order to maintain Riley’s youthfulness and innocence. I considered that the use of the Santa suit as a metaphor for an identity crisis. However, I interpreted that by wearing the suit, the boy begins to question his (sexual) identity. He has a monologue about how he has to hide all his desires to be with Connor because he is pretending to be something that he is not, which is similar to pretending to be Santa Claus. I won’t go too far into detail of what happens, but that is what I found interesting in the story. I know he wanted me here, but why did it have to be like this? I want him to introduce me as his boyfriend…I am worried about being in love, because it involves asking so much. I am worried that my life will never fit into his. That I will never know him. That he will never know me. That we get to hear the stories, but never get to hear the full truth. Besides “The Lady and the Fox” by Kelly Link, the last three stories I will comment on have a fantasy element too. The first story, “Polaris is Where You’ll Find Me” by Jenny Han, is about a human girl, Natty who lives in the North Pole and has a crush on one of Santa’s elves, Flynn. This short story wasn’t what I was expecting from Jenny Han. I was hoping for a romantic holiday story that is similar to To All The Boys I’ve Loved Before, but I wasn’t completely disappointed. There is a little twist in the end that leaves a reader with wonder and possibility (for a continuing story, perhaps). The other two stories took a spin on the holidays by discussing pagan beliefs on holidays as oppose to considering Christmas as a Christian holiday. After I finished reading, “Krampuslauf” by Holly Black, I had only one thought, “WTF!” Now it wasn’t out of frustration that I used this term, but pure amusement. If you aren’t familiar with the term, Krampus, it is a beastly creature whose origins are from Alpine folk stories. The Krampus punishes misbehaved children around Christmas by kidnapping and carrying them into the black forest. Now that doesn’t sound like a story you would want to tell children around a warm fire on Christmas. However in Holly Black’s “Krampuslauf,” the female protagonist and her friends indulge in bad behavior like underage drinking, infidelity, and extreme physical violence; thus, one may argue that these fictional teens should be punished by a Krampus for this type of bad behavior. This story was one of my favorites out of the whole collection. I won’t spoil the ending, but just so you know, the “WTF” moment I had for this story occurred at the climax. “The Girl Who Woke the Dreamer” by Laini Taylor is drawn from pagan values. Within the story, there is a Christmas tradition. During December, a man gives gifts to the girl he loves for 24 days until Christmas Eve. On Christmas Eve, the two lovers will finally meet, seal their fates with a dance, and become husband and wife. However, a girl can reject her suitor by leaving a dead flower on her porch the next night. Taylor also creates the existence of a mythical, black feathered god called The Dreamer that lives on the Isle of Feathers. The Dreamer sends beautiful gifts to Neve such as a jeweled beetle ring. The Dreamer and his gifts are mystical and uncanny. I consider him as one of my favorite characters in this anthology. He was a dragon and a bird and a wolf and orchid and lightning bold—and he was a man, too. A thousand facets, he was like a jewel of infinite dimensions. Aside from the mythical creature, The Dreamer, what I liked about this story is Neve’s feminist personality. Neve refuses Reverend Spear’s gift, the Bible, and bluntly tells him that she does not want to marry him. Despite her rejection, Reverend Spear continues to pursue Neve. In order to escape her misery, she calls upon the Dreamer to wake up from his slumber and save her. Neve is a girl who has no interest in getting married and has an aura of independence and freedom. She is an ideal heroine because she refuses Reverend Spear, a man who does not value women, as evident to his previous wives who were sent to their graves for unknown reasons. So would I recommend this book to readers? For YA enthusiasts, yes. As for other types of readers, maybe only if you are interested in reading something that is Christmasy. Happy Holidays! And Happy Reading!